→Penny Nickel Skateboard Review : Brand Matters! Penny Nickel Skateboard Review : Brand Matters! Skateboarding has come a very long way since its earliest days. In the 1970s, as the sport began to resemble what it would eventually evolve into, one little toy was ubiquitous. The little plastic banana board was on every other driveway back then, usually with some small child aboard with a smile from ear to ear. 2 Are The Parts Good? 2.1 Bearings and Hardware Will Need an Upgrade Eventually! 2.2 Nickel Boards are for Everyone! The banana board has made a comeback in recent years, and Penny Skateboards’ example is a prime reason for its surge in popularity. These little boards are scooting across college campuses everywhere, every day, but their diminutive size isn’t for everyone. To some riders, size does matter. So, this Penny nickel board review will feature the little Penny’s bigger brother. Nickel isn’t a real name, but rather a nickname the big Penny picked up along the way. Is the nickel board a toy? Or, is it a real skateboard? One thing is for certain: It’s not your dad’s banana board. Penny is a company dedicated to the revival of the original plastic skateboards of the 1970s. After first getting his start making trick skateboards in the 2000s, MacKay decided to attempt to bring back the little banana board on which he had cut his teeth as a youngster. The resulting board, the Penny board, has fast become the gold standard of this type of cruiser. Wider Deck Than Most Micro Skateboards! The standout feature of the Penny nickel skateboards is its size. At 27 inches in length, it towers above its little brother — the 22-inch Penny board. The nickel board is also wider than the original Penny boards, with a 7.5-inch width versus the smaller board’s 6-inch width. The result is a wider platform, giving the nickel considerably more stability than its little brother, especially when the speeds get faster. Penny’s nickel boards have 4-inch-wide trucks, almost a full inch wider than the original Penny board’s trucks. While the extra width does widen their turning radius just a bit, the nickel’s Penny trucks are still capable of sharp carves. They are also more stable when going fast in a straight line. These nickel boards come with Penny’s yellow, 83a bushings. This is a softer bushing durometer, making these nickels dig into curves regardless of how tight the kingpin is. Penny’s wheels are famous throughout longboarding circles for their smoothness. At 59mm and 83a, these wheels are the exact same models Penny uses on its 22-inch plastic skateboards, but they seem to fit the bigger board more naturally. The 59s crowd the underside of the smaller boards, at least in appearance. But on the bigger nickel board, these wheels seem in perfect proportion. The 83a durometer is in the middle of the road compared to competing plastic skateboards — not the softest, but soft enough for a comfortable ride. Bearings and Hardware Will Need an Upgrade Eventually! Bearings are a common tripping point for complete, off-the-shelf skateboards no matter the brand. Penny bearings are better than most of their competitors, though. While silky smooth at first, these bearings will degrade faster than some aftermarket skateboard bearings. The length of time they last depends greatly on how they are used, however, so skate accordingly. There are numerous brands that can replace these Penny’s bearings, some of which are listed in our guide here. Penny uses Allen-head bolts, which are much more difficult to strip out than the typical Philips-head truck bolts. The 1.125-inch bolts are nickel plated to prevent rust. Each component from a Penny board is replaceable with OEM equipment. Nickel Boards are for Everyone! For those old enough to remember the banana boards of yore, these Penny boards are an entirely different animal. While the 22-inch Penny board is a replica — albeit an improved one — of those old plastic relics, nickel boards are closer in size to trick skateboards. Being the real deal and an original, Penny nickel boards can cost a bit more than some of their competitors. Check their current prices here, as they’re listed on Amazon.com here. While you can buy a cheaper board, you would then have to skate it. Penny nickels come with top-notch deck, trucks, and wheels. These quality components cost the company more to produce than cheap, knock-off parts cost their competitors. Penny is not offering the cheapest board on the market, they are offering one of the best. To get an idea of the competition Penny faces, check out our list of the best penny boards available. Penny Skateboards made the Cadillac of plastic mini cruisers, and the 27-inch nickel continues the tradition of quality. Its proprietary plastic formula flexes just the right amount to prevent damage, but is strong enough to support most adults. Penny trucks are a real strong suit, smooth turning and sturdy. Penny’s wheels are also some of the smoothest to be found on off-the-shelf plastic boards. 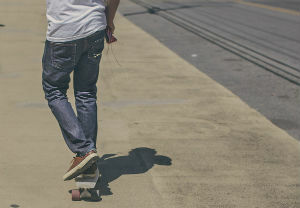 There’s not much to not like in a Penny board, especially a Penny nickel skateboard. The bearings are smoother than most at first, but degrade quicker than top bearing brands might. And the Allen-head bolts can be a challenge, as screwdrivers are ubiquitous but hex keys are not. Ultimately, though, no imitator can reproduce a true original. For those that seek a quality plastic board that will last for years, the Penny nickel skateboard is the only way to go. Penny’s littlest boards are fun, but the deck space is cramped, even for small feet. Adults that ride and are interested in one of these plastic cruisers should consider upgrading to the larger nickel-size boards. They are fast and smooth, and incredibly maneuverable. They can carve with the best longboards on the market, and they are a blast for trying tricks that have been mastered on more traditional skateboards. As cross-campus transportation, the Penny nickel board is hard to beat. In a throw-away world, the Penny nickel is a sleek collector’s item.